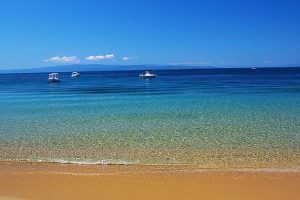 As far as Skiathos holidays are concerned, this marvellous island boasts home to some of the most impressive beaches in Europe. 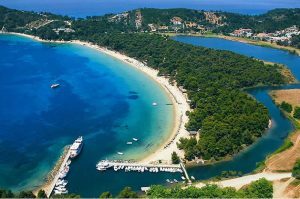 Covered with forests of pine trees and offering an abundance of soft sand and crystal clear water, Skiathos beaches make for top holiday destinations. 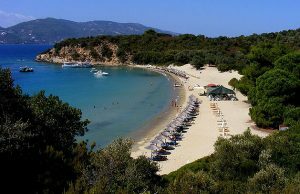 Most Skiathos beaches on the southern side of the island are organized with umbrellas, sunbeds and water sports galore. Boats can also be rented to make the tour of the island. 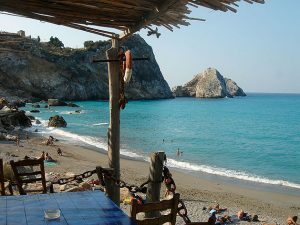 On the northern side of Skiathos, the beaches are more secluded and frequented by lovers of nature. 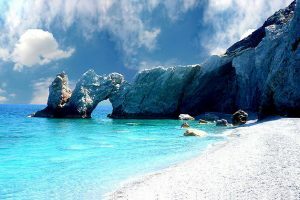 Below, you will find a list with of the very best that Skiathos beaches have to offer. 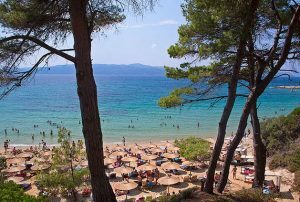 Coined as the most famous of Skiathos beaches, Koukounaries beach offers fine white sand and a fragrant pine tree forest from which the region took its name. Also considered as the most unspoilt beach of the Mediterranean, this infamous beach is an officially protected environment. The gorgeous deep aquamarine waters make plenty of room for water sports and lazing around in the sun, whilst serving up a selection of beach bars. A local bus linking this beach to the capital makes for easy transportation to and from. A certain curious dirt road from Koukounaries continues further south and splits in two, where one end of the road leads to the sandy bay called Banana beach, well due its peculiar shape. Banana, as an ironically organized beach with fine sands and uber-blue waters, offers a spectacular variety of water sports. What about the other end of the dirt road? Well, it continues up to the smaller bay, fittingly called Little Banana, which is in turn a nudist beach. Little Banana is smaller and more discreet than its neighbour, with water just as superb. 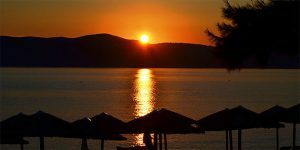 Positioned 14km from Skiathos Town and Villa Eleven too, this golden sandy beach lies just around the corner from the infamous Koukounaries. Taking its name from the Saint Helena inspired chapel nearby, Agia Eleni is a small cove that’s the ideal location for children due to shallow waters. Similarly, only a small part of the beach is organized with few umbrellas, which makes for an intimate experience. The surrounding luscious trees easily serve as shelter from shade whilst giving a true sense of natural beauty. As for access to this beach, it’s easy as various options are available. This beach is unique in the way that it’s only accessible by boat from the port of the capital city. Situated on the north-eastern slope of the island, Lalaria is an idyllic pick as far as Skathios Holidays are stretch- a place that features incredible beauty with huge white cliffs mounting out of the deep blue ocean. Close to the beach, there is a rock that forms a natural bridge between the sand and the sea, with a curious hole in the middle. This rightly serves as some sort of submarine passage and a most adventurous treat for some. 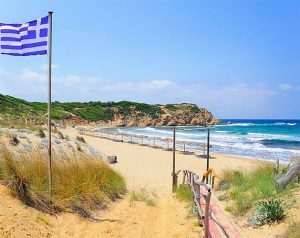 Aselinos beach, as it is located on the northern side of Skathios, is a long beach with lustrous sands and tiny pebbles. 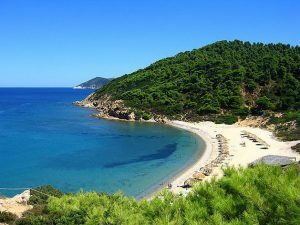 Popular amid Skiathos holidays as a pit stop for daily expeditions into the great natural environment, this beach is surrounded by the majestic Kounistra Mountain. Vastly green in reaching all the way to the shore, Aselinos is a lovely, exotic and romantic spot due. Offering a small yet charming tavern with a great view to the sea, you are guaranteed an unforgettable night. Vromolimnos is another beautiful beach located at the south coast of Skiathos, near the coastal resort of Kolios. A lovely bay with serene, spotless waters and fine sand, Vromolimnos is known as the second most popular beach after Koukounaries. The beach offers the usual facilities like umbrellas and sundecks, and is furthermore a hot spot due to the atmospheric music provided by beach bars. There is the water sports option, coupled with remarkable views and similarly spectacular sunsets. Vromolimnos is easily accessed by car, taxi and the public buses coming from the town. Located on South-west side of Skiathos, Mandraki elias overlooks the Aegean whilst incorporating the Kechria beach of Skiathos. There is a snack bar that serves numerous snacks, all kinds of coffees, refreshing cocktails, drinks and sodas. 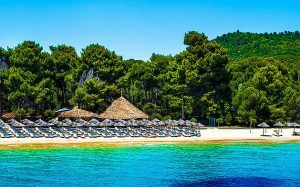 One is sure to enjoy the warm sun of Skiathos while lounging on the wooden umbrellas and lazy chairs at the sandy beach of Mandraki elias, as it lies snuggly next to crystal blue Aegean Sea waters. Tsougrias beach is a beautiful place that’s covered with pine trees and eucalyptus-with the most amazingly green crystalline waters. Officially rated the most visited islet located across Skiathos, ironically, there are just few umbrellas but no water sports. More for people who own their own boats, the atmosphere is relaxing and the scenery magnificent. Conveniently, there are boats leaving on a daily basis from the port. Why not pack your sunscreen and backpack and take a boat trip round to Kastro beach to have the loveliest experience? Or, have a couple hours’ worth of fun tomb raiding various churches and ruins. 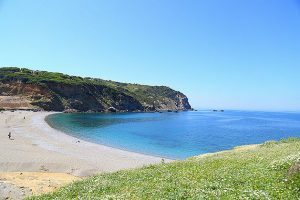 In a country packed with amazing archaeological mysteries, Kastro is a solid beach that offers a great taverna with a highly recommend Calamari dish. Definitely worth a visit and a shame to miss while visiting Skiathos island. Strategically located to the extreme end of the airport runway, This beach is not very accommodative, for since being subject to very strong it is a grubby beach with more gravel than sand. Xanemos beach is mostly popular to those tourists who stay in the periphery of the main town.